I had hosted people a few years ago when I was living in Sydney, and I really enjoyed it. I was loving to hear about everyone's story of their previous and future destinations. But never have i had the pleasure to experience couchsurfing as a guest. Well now it's done. I stayed with Andrey who very kindly picked me up at the train station. As we entered his nice apartment that he was sharing with one other person, he showed the room we would be sharing and the first thing i noticed is that there was no bed. Not that I was expecting to sleep on a bed at all, but I thought of him. He told me that he had moved 3 times in the past 3 months so he did not want to have furniture any more and that he got used to sleep on camping mattresses. Ok. He then went through the pictures he took during his last trip to Kyrgyzstan, Tadjikistan and Uzbekistan. He basically flew there with his backpack, his mattress and his tent, and hitchhiked through the countries. He showed me how he was setting up his tent on the side of the road just after crossing a border, spent a night in a cave on a top of a mountain... And I thought I was on an adventure! My journey looks like a luxury trip compared to his. I was really impressed. 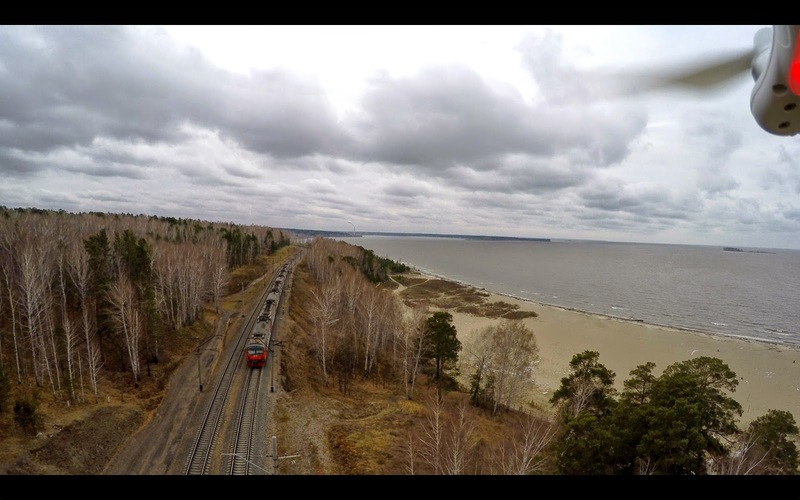 On the second day he agreed to take me to a location where I could film trains passing by with my quadcopter. I felt so much like a weirdo when I asked him this. So we went a bit out if the city in a nice location near what's called the Ob sea. It's where the Ob river is probably at its widest and it is so big that it really looks like you are in front of the sea. I took a couple of shots and we went eating in a typical "Soviet cantin". The name was "Stolovaia". It is like a cafeteria with nothing fancy where you can eat a lot of good food for a small amount of money. I kind of overfilled my tray, willing to try everything i hadn't try yet (remember, I love food) but I did not waste. Then he gave me a nice tour of the neighbourhood, where they've built a lot of different institutes in order to keep the "brains" from leaving the city to emigrate to Moscow or in a foreign country. And sometimes it is made pretty clear as you can see from the sign in the picture below.The day came quickly to an end and we went out for diner and a beer. The next morning it was already time to pack, say good bye and head to the train station. So, my first couchsurfing experience as a guest was a success and I will definitely try it again in the future. There's no better way to discover a city than by spending time with people who actually live there. So if you have the opportunity or if you are thinking about it, I highly recommend you try couchsurfing.